As a Webmaster, you can designate other users to be webmasters. Any registered school employee or Associate may be given webmaster rights. 1. From your portal, click on Webmaster Center. 2. Hover over the Manage menu. 3. Click the Add Webmasters link. The Webmaster Center link will appear in the Quick Links section on the portal homepage of users given webmaster rights. 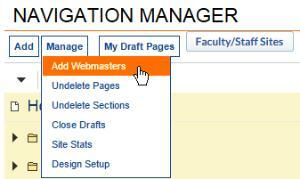 Admins always have the Select Webmaster option via the User Management button in their accounts. Webmasters can make any School Loop user an Editor or Contributor of a section of the website. To assign rights to a section, begin in the Webmaster Center and select Full Site Map. 2. Click the Rights button near the top right corner of the page. 3. Select Add Editors or Add Contributors. 4. Check the box next to the name of the user. 5. Click the orange Add button. Editors and contributors will see a link to their section(s) of the website on their portal homepage in an area called Websites. Clicking the link for a section will give them access to the web publishing tools for that section. Editors can publish content and edit pages within their sections without approval from a webmaster. Contributors, on the other hand, must get approval for any changes they make to their sections. When a contributor publishes a page, they will see an Approval Pending message. The page will not go live until approved by a webmaster. As Webmaster, you are responsible for approving homepage news and events published by others. You also can approve work submitted by contributors. A list of the all items waiting to be approved will appear in a green-bordered box on your portal homepage. Click the title to view the item. You may choose to approve or disapprove each item. Homepage news and events requiring approval are listed at the top of the left column in the Webmaster Center. Use the All Items button to see the same complete list of items needing approval found on your portal homepage. Alternately, you may click the Activity button near the top right of the page when working with any of the sections. The Activity page lists only the items needing approval for that section.